Bank of America Corporation, a holding company, provides banking and nonbanking financial services and products in the United States and internationally. They serve the financial needs of 98 percent of the U.S. Fortune 500 and one in three midsized to large companies across the United States and in more than 20 countries.Bank of America was founded in 1874 and is headquartered in Charlotte, North Carolina. Bank of North Carolina is a North Carolina-chartered banking corporation that offers a full array of commercial and retail banking services. Bank of North Carolina offers retail and commercial deposit services, retail and commercial loans, trust and estate planning services, mortgage loans, construction loans, safe deposit boxes, online banking and online cash management. It operates for the primary purpose of serving the banking needs of individuals and small to medium-sized businesses in its market area. BB&T Corporation, through its subsidiaries, provides various banking and financial services in the United States. The company's lending activities include small business, commercial middle market, real estate, retail, home equity, sales finance, home mortgage, and commercial mortgage lending. 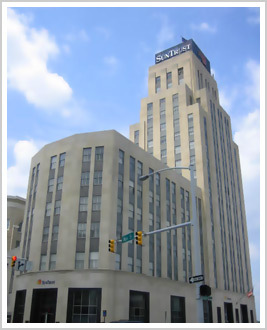 BB&T was founded in 1906 and is headquartered in Winston-Salem, North Carolina. Capital Bank Corporation operates as the holding company for Capital Bank, which provides general commercial banking services in North Carolina. Its loan portfolio includes real estate, construction, businesses, agriculture, personal uses, home improvement, and automobiles loans, as well as equity lines of credit, credit loans, and consumer loans. Capital Bank Corporation was founded in 1997 and is headquartered in Raleigh, North Carolina. In December of 1990, in an effort to address the shortage of affordable housing in North Carolina, the North Carolina Bankers Association formed Community Investment Corporation of the Carolinas (CICCAR). CICCAR is an affordable housing loan consortium whose sole purpose is to provide long term, permanent financing for the development of low-moderate income multifamily and elderly housing. First Citizens BancShares, Inc. operates as the holding company for First-Citizens Bank & Trust Company (FCB) which provides full-service banking services for retail and commercial customers. One of the largest family-controlled banks in the United States, the company offers commercial and consumer lending; deposit and cash management products; cardholder, merchant, and wealth management services; and various other products; as well as services incidental to commercial banking. First Citizens Bank was founded in 1898 and is based in Raleigh, North Carolina. The Bank is a chartered commercial bank with banking and insurance agency offices in eastern and central North Carolina and eastern Virginia. The Bank serves its customers from 24 offices: 13 in Virginia, 11 in North Carolina and a private banking center in Raleigh. A full-service commercial bank offering business and consumer loans, checking accounts, certificates of deposit, money market investment and savings accounts, Internet banking and other products and services. The company was founded in 1907 and is headquartered in Durham, North Carolina. PNC offers a wide range of services for all customers, from individuals and small businesses, to corporations and government entities. One of the leading credit providers to middle market companies across the country, PNC is in the top five syndicators of middle market loan transactions for each of the last five years. SunTrust Banks, Inc., with total assets of $182.2 billion on December 31, 2006, is one of the nation's largest and strongest financial holding companies. Through its banking subsidiaries, the company provides deposit, credit, trust, and investment services to a broad range of retail, business, and institutional clients. SunTrust Banks was founded in 1891 and is headquartered in Atlanta, Georgia. Minneapolis-based U.S. Bancorp, with $419 billion in assets, is the parent company of U.S. Bank National Association, the 5th largest commercial bank in the United States. The company operates 3,164 banking offices in 25 states and 5,020 ATMS and provides a comprehensive line of banking, investment, mortgage, trust and payment services products to consumers, businesses and institutions. Wells Fargo & Company is a nationwide, diversified financial services company with $1.7 trillion in assets. Founded in 1852, Wells Fargo provides banking, insurance, investments, mortgage, and consumer and commercial finance services through more than 8,700 locations, more than 12,500 ATMs, online, and mobile devices.